The Port, Fortresses and Group of Monuments, Cartagena, comprise the surviving remains of military constructions and an important way station for exploration and trade developed by the Spanish in the New World. Cartagena, formally known as Cartagena of the Indies is a large city seaport on the northern coast of Colombia. Founded in 1533 by Don Pedro de Heredia, and named after the port of Cartagena in Spain's Murcia region, it was a major center of early Spanish settlement in the Americas. A few years after it had been founded, the Spaniards designed a defense plan in which the main strategy was the construction of a walled military fortress to protect the city against the plundering of English, Dutch and French pirates. The day we arrived in Cartagena (Nov. 2010) it was pouring rain. The streets were flooded, traffic was backed up and it was hard to get around. Nevertheless, it was nice to be there during the rainstorm because we saw a unique side of the city. When it rains, the water comes off of the fort in large, cascading waterfalls. Whether that was by design or merely water finding any open outlet, it created a unique and interesting view. The local children gathered under these waterfalls to play and bathe. The old town area wasn't flooded and we spent some time exploring that area, too. The rain also meant that not as many tourists were there and that there were fewer street vendors competing for our attention (although several enterprising ones were selling umbrellas). We visited Cartegena in the spring of 2009 and took a harbor cruise. We were able to see how the Spanish organized the 8 forts defensively to protect against pirate attacks. The view of the city's skyline in fantastic! We saw the spires of cathedrals outlined against a pristine, blue sky. We could see the building of modern skyscrapers being constructed. And, most impressively, the size of the bay. It is immense! No wonder Cartegena has been an important port for centuries. Cartagena is a port city known for its giant fort. Think old town San Juan, Puerto Rico or Campeche, Mexico only bigger. The town is extremely well preserved and receives few tourists most likely because of Colombia's violent drug trafficking. The clean and tidy town is dominated by a huge, well preserved stone fort that can be explored from top to bottom. The streets beneath the fort are a cobbled jumble of colorful two story homes and shops. An elevated promenade along the water (appears to be a built up sea wall) allows you to see all over the historic centre. Spanish colonial architecture influence is evident throughout the old part of the city. Cartagena contains some beautifully preserved churches and convents in the hills above the town as well as the requisite spanish baroque style cathedral in the city centre. 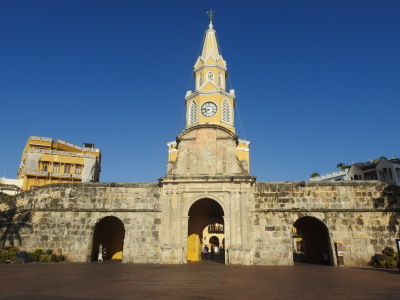 Cartagena also has some areas that are not tourist friendly but it is generally safe. You need to speak at least a bit of spanish though for an enjoyable visit. Prices are dirt cheap!! Piracy: "In the 16th century alone, Cartagena suffered five dreadful sieges by pirates, the most famous (or infamous) of which was that led by Sir Francis Drake." 105 Community Members have visited.